Most of the times, companies in their beginning stage complete all of their tasks by themselves. It is easier for them due to minimum amount of work and it is also cost-effective. But with the advancement in business activities, it becomes difficult for them to handle the ever-increasing tasks by themselves due to overload. It is also not feasible for companies to hire full time staff for things that are usually required in specific time of year. In these types of circumstances, outsourcing is the best option. In this procedure, companies accomplish their own or other companies’ tasks through any third company or individuals. Currently, outsourcing has become a leading procedure for many big and small companies and they prefer such type of activity for smooth running of their business. Due to growth of this type of business activity, now large number of outsource companies are also present in different markets. Such companies act as intermediary between the one that wants to outsource work and the other that completes work for outsource. As outsourcing companies are getting popularity in business arena, Dubai decided to assist them gather in a single area. 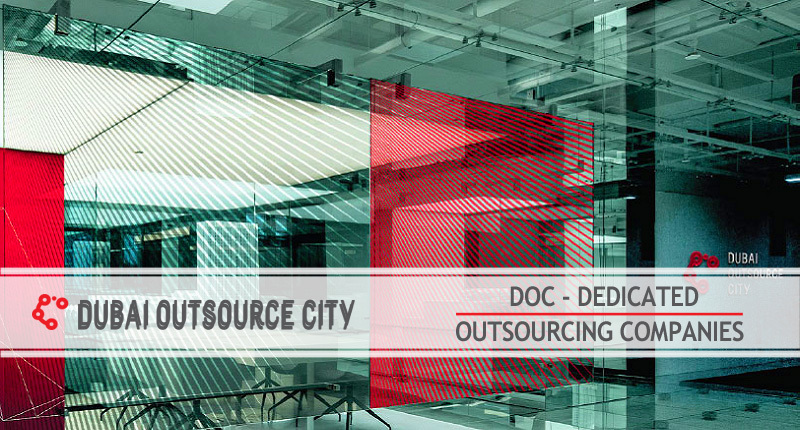 For this purpose, Dubai Outsource City (DOC) was established in 2007. This is the world’s first free zone dedicated for local and international outsourcing companies. The purpose of this exclusive free zone is to provide best facilities to outsourcing companies for their growth. Few of these include latest office space, sophisticated telecom infrastructure, complete security, venue management, networking opportunities, networking etc. Apart from these specific benefits, other free zone advantages are also available. This specific free zone is best place for companies providing BPO (business process outsourcing), IT outsourcing, HR outsourcing, call center operations etc. Setting up a company in DOC is not a difficult task. Two types of companies are allowed in DCO. Free Zone Limited Liability Company (FZ-LLC) is an independent company with its own shareholders. The other option is setting up Branch of a foreign/local company. Company formation is also quite simple process. The intended company has to submit application with required documents and payments in DOC. Later a company can be established after its approval from authorities. The whole process looks simple but it is difficult if a company tries to act on its own for registration. The better and safer option is to take assistance from a reputable business consultancy firm like Riz & Mona Consultancy. We are helping companies setting up their businesses in Dubai mainland and free zone company formation.